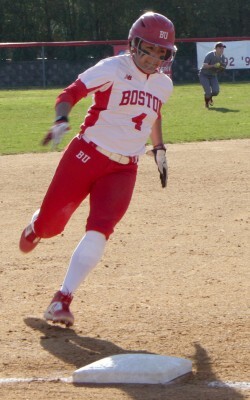 The Boston University softball team will look to make it two in a row Wednesday afternoon when it heads to Smithfield, Rhode Island to take on Bryant University in the first of two road games. The Terriers (14-20, 2-4 Patriot League) will then travel back to Massachusetts to take on the University of Massachusetts Lowell Thursday afternoon. BU head coach Ashley Waters’ team is set to take on the Bulldogs (6-28) on the heels of its first Patriot League series win. BU took two of three from a talented Bucknell University side, and following the games against the Bulldogs and the River Hawks (8-34), it has five more home contests against conference opponents. With a Patriot League-heavy slate of games on the horizon, these next few days will be critical toward establishing momentum for this team that has struggled to get going in the early parts of the 2016 campaign. Most recently, the Terriers are coming off Sunday afternoon’s 2-1 victory against the Bison (23-19, 7-5 Patriot League) in a pitcher’s duel. Senior Lauren Hynes earned her ninth win of the season in a complete game three-hitter. Hynes, a native of San Diego, has been the leader of the Terriers’ pitching staff this season, pitching a team-high 114 1/3 innings and holding opponents to a .250 batting average. Despite the strong showing this weekend, Waters noted that there are certainly areas where the Terriers can look to improve, starting with the games against Bryant and Lowell. Sophomore outfielder Jilee Schanda went 1-for-3 in the series finale against Bucknell, while also collecting her 10th RBI on the season. Schanda has the third-highest batting average on the team this year and is one of three Terriers batting above the .300 mark. Junior infielder Brittany Younan, whose .373 average is tied for seventh in the Patriot League, and junior Moriah Connelly are the two others. If the Terriers are to build on this weekend’s momentum and string together some victories, look for this core group of players to continue to make contributions. The Bulldogs come into this game following consecutive losses, the latest a 15-2 thrashing at the hands of the University at Albany. They are 4-4 at home this season and have struggled with consistency across the board despite the efforts of a few standouts. Junior Taylor Burger has three home runs and 13 RBIs for Bryant, and senior Elle Madsen has been impressive on the mound, compiling a 3.18 ERA and hurling seven complete games. The River Hawks have endured similar struggles this season, as they’re winless both at home and in their conference so far. That being said, they most recently bested Central Connecticut State University 3-2 on Tuesday and will be eager to keep this winning nature alive against the Terriers. BU will be going into these games with a similar mindset, and Waters touched on how important this next set of games is in building confidence for her team.